Foster Creek Avenue was previously a 22′ wide street with narrow shoulders and no pedestrian facilities or on-street parking. Pedestrians used either the roadway or gravel shoulders for a walkway. 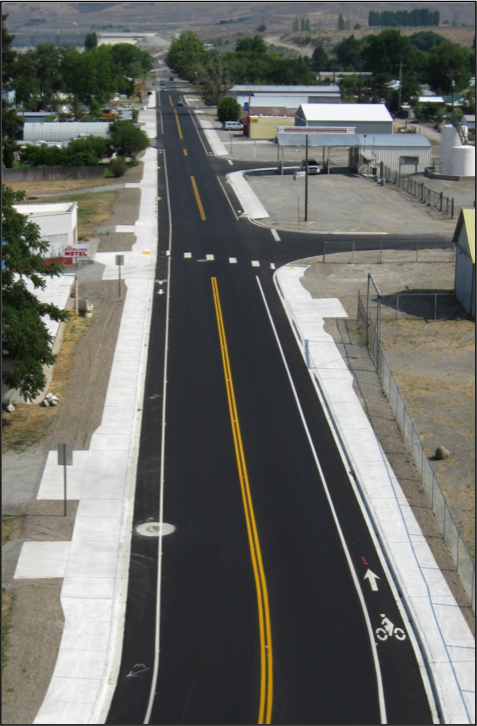 TD&H Engineering provided improvements to the roadway, consisting of two 11’ travel lanes, two 5’ bike lanes, curb, gutter, and sidewalks. The outer 6’ of roadway on the non-sidewalk side and 11’ on the sidewalk side were widened to accommodate the improvements. After widening, a 2” HMA overlay was applied full width throughout the project lines. Our services included design, topographic survey and site mapping, cost estimating, and coordination with WSDOT. Construction services included plans and specifications, bidding assistance, construction staking, contract administration, inspection, and materials testing.